Let us now look at the last part of this chUrNai. analOchitha viSEsha aSEsha lOka SaraNya – bhagavAn is the entity in the whole universe to surrender to, for all people, irrespective of any special qualifications. He does not see whether the person is from a good family by birth or is rich or is highly knowledgeable in vEdha and SAsthra. In rAmAvathAram, SrI rAma tells sugrIva when sugrIva asks rAma not to accept vibhIshNa, when he comes to surrender, that he will accept a person even if he has any fault in him. In SrI rAma charama SlOkam he says that it is his vow to give protection to everyone who surrenders to him . praNathArthihara – praNatha means those who surrender to him. Arthi is their strong urge or craving to be with him. hara is to remove. Thus, bhagavAn removes the craving of his Asrithars and takes in those who surrender to him. ASritha vAthsalyaika jaladhE – vAthsalyam, as we have already seen, is treating the faults in ASrithars as good qualities just as a cow treats the dirt on the body of its new born calf by licking it off completely and making the calf look clean. jaladhi is ocean. The vAthsalyam that he has in his ASrithars is like an ocean. anavarathavidhitha nikhila bhUthajAtha yAthAthmya – nikhila is all. bhUtha means entity or specimen. jAtha is type or class. anavaratha means incessant (without any stop); vidhitha means various. yAthAthmya is real or basic nature . He is one who knows the ultimate truth in all entities. There is no need for us to say that “I am not a good person; I have all faults” to go to him since he already knows about us. aSEsha charAcharabhUtha nikhila niyamana niratha – aSEsha is without leaving anything; charAcharabhUtha is all movable and immovable entities; nikhila is all; niyamana is the ability to direct or control; niratha is being engaged in. He has the ability to control all entities at all times. He can not give up on an entity saying that it is uncontrollable. SrI rAmAnuja conveys here that both samsAram (the materialistic world) and he himself are under bhagavAn‘s control. Can he not cut off the chain that is binding SrI rAmAnuja to samsAram? aSEsha chidhachidhvasthu SEshibhUtha – chith and achith are sentients and insentients respectively. SEshi is master. He is the lord and master of all entities in the world. What SrI rAmAnuja conveys here is that since you own me, should you not do what is required to be done for me to reach you? nikhila jagadhAdhAra – he bears the entire universe. He bears those who commit faults too. You are the basis for my existence and you have to protect me, says SrI rAmAnuja. akhila jagath swAmin – He owns the entire universe. He removes our faults and creates the desire in us in reaching him through the act of surrender. asmath swAmin – It is not enough if bhagavAn is owner of the universe. I have to accept this fact and tell him that he is my owner too. You are also my owner, says SrI rAmAnuja, specifically, to emphasise that it was bhagavAn who brought him around and made him to surrender. sathyakAma – this is the third time that this word and the word following this (sathya sankalpa) are mentioned. But on each occasion, the word takes a different meaning and context. In the first occasion when SrI rAmAnuja mentioned this word while describing the qualities of bhagavAn, it was meant as one possessing good qualities liked by his ASrithars (those who surrender to him). In the second instance, it was meant to indicate his desire to play with AthmAs in nithya vibhUthi (SrIvaikuNtam) and leelA vibhUthi (materialistic world). Here (3rd instance) it conveys the meaning that he is one with no unfulfilled desire. He is fully satiated with all desires fulfilled. He is pleased with whatever we offer him when we perform our daily prayers and rituals (thiruvArAdhanam). There is nothing that he does not have that I have to offer and satisfy him. sathyasankalpa – in the first instance that this word was used in conjunction with describing his qualities, it meant his ability to create rare things which would not go waste. In the 2nd instance it meant that once he decides to grant mOksha (SrIvaikuNtam) to someone, he takes it to completion without any hurdle. Here it conveys the ability to keep together things which are incongruent. He takes a jIvAthmA to SrIvaikuNtam and makes the jIvAthmA to mix freely with the nithyasUris and they welcome the jIvAthmA happily. 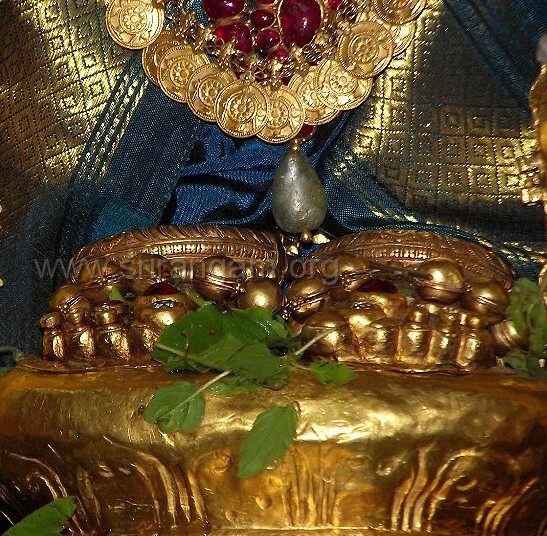 sakalEthara vilakhaNa – superior to all the other entities. He is superior in terms of his svarUpa (basic nature) and qualities. These qualities and nature are meant for the enjoyment of others (his ASrithars) and not for himself. He is rakshakan (protector) to everyone. That quality is fulfilled when his qualities are enjoyed by all. Even if one person is not protected bhagavAn takes it seriously. Thus SrI rAmAnuja says that since he is not able to enjoy bhagavAn‘s qualities (being in samsAram) bhagavAn would not feel fulfilled. arthi kalpaka – granting what his ASrithars want, especially himself. He went begging as vAmana to mahAbali chakravarthi to get back the three worlds that he had entrusted with indhra. When he goes to the extent of begging to satisfy his followers, will he not grant the desire of those who beg him to grant mOksham? Apath sakha – being a friend in times of danger, i.e being supportive. Even when parents and relatives closed doors when protection was sought, bhagavAn did not do this (story of kAkAsura). Sriman – consort of SrI dhEvi. Here the context that SrI rAmAnuja highlights is that even if bhagavAn can get angry with us due to our shortcomings, pirAtti (SrI dhEvi) acts as purushakAra bhuthai (one who recommends our cause) and makes him grant our wish. Hence SrIman. nArAyaNa – before SrI dhEvi became purushakAra bhUthai, when he created the universe was he not our protector? SrI rAmAnuja reminds him of that role. ananyaSaraNOham – I am without any other place of refuge. thvath pAdhAravindha yuglam SaraNam prapadhyE – thvath – your; pAdham – foot; aravindham – lotus like (foot is equated to lotus to highlight that it is sweet and can be enjoyed by carrying out service) ; yugalam – pair; Saranam – proffer or prostrate; prapadhyE – mentally behold or catch onto. SrI rAmAnuja says here that he proffers himself to the two lotus-like exalted feet of bhagavAn and recites the dhvaya mahAmanthram (the reader is requested to contact his AchAryan for learning about dhvaya mahAmanthram). SaraNAgathi is not merely a physical act or a prayer to be recited. It is more of a mental action by which the person who performs SaraNAgathi commits mentally that he accepts bhagavAn as his protector and asks bhagavAn to take him under his wings and give him the most enjoyable role of being a servitor to bhagavAn and pirAtti for ever. athra dhvayam indicates we should recite “dhvaya mahA manthram” at this time (as customary, this manthram is also recited subtly so only the reciter can hear it). This completes the 5th chUrNai. We shall now move onto chUrNai 6. Translation by krishNa rAmAnuja dhAsan. This entry was posted in gadhya thrayam, Other, SaraNAgathi gadhyam on December 22, 2015 by T N Krishnan.